After more than two years in Panama, it was time to move on. Despite the wonderful memories and lifelong friends we've made there, there was so much more we want to eat, see, and experience … so on June 1, 2013, we moved our belongings to our new home in … Ecuador! Three days later, and we were on our first trip. Our plan: Five days and four nights in the Amazon basin, east of the Andes mountains, seeing parts of Ecuador most people never even thought existed. Now we’re back in our new apartment working on photos and stories from our trip. One of the highlights of the tour was our stay at Cotococha Amazon Lodge, a fabulous lodge that truly expresses the Amazon in its décor. 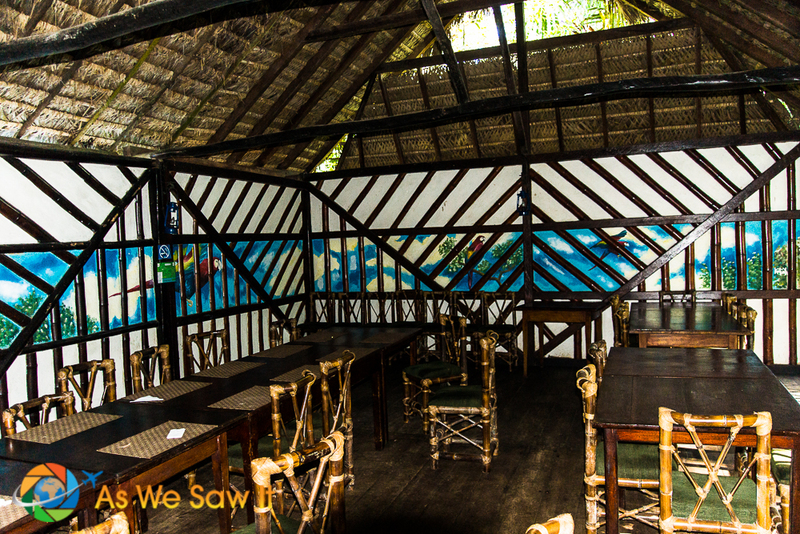 Every building there, from social areas to bungalows, is built of wood and natural materials, in an architectural style typical to the region. I particularly appreciated the thatched roofs. which were made with local palms. They made the open-air social areas – dining room, bar area, and even a nice sitting area with a fireplace – cozy, comfortable and welcoming. Here's the dining room. Look at the ceiling! 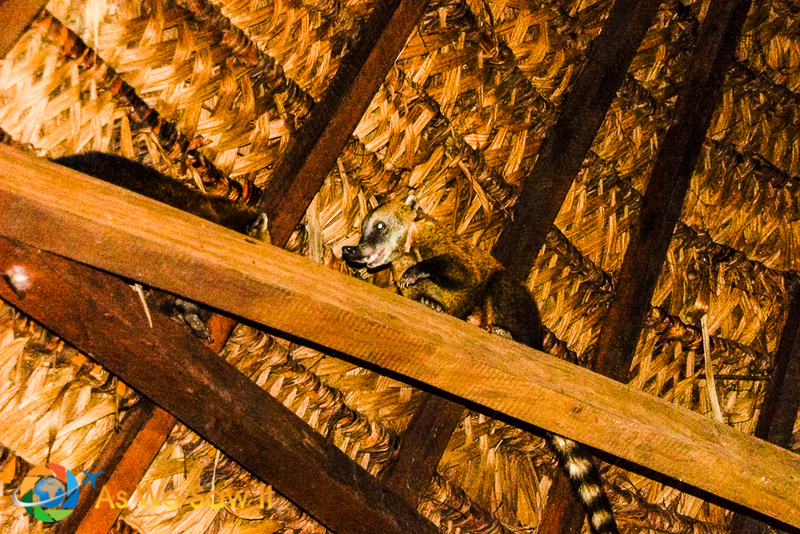 As Ricardo, the lodge manager, gave us an orientation to our stay, two cute little coatimundis acted as welcoming committee and played overhead. I was so enchanted by their antics I almost missed an important question: “Do any of you have any dietary restrictions?” It's a small thing, but I thought it said a lot about their level of attention. They then managed to plan all of our meals so everyone would be happy. For us: no red meat, no pork or shellfish, no wheat. We all got what we needed … and the chef did an amazing job, too. 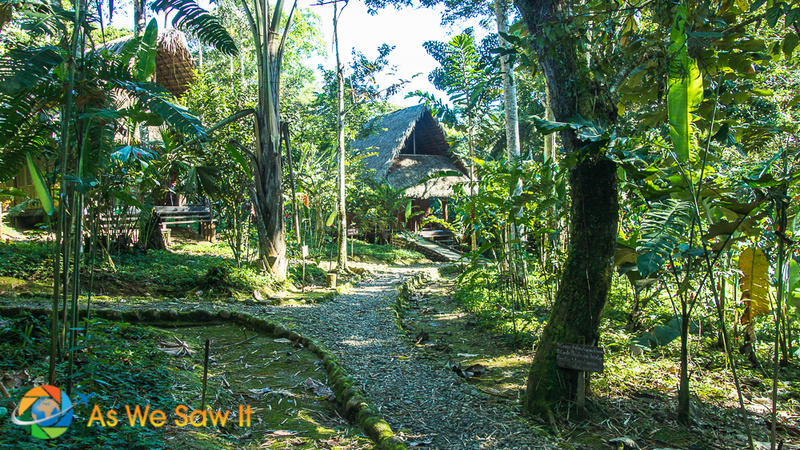 Each of us stayed in our own spacious bungalows which, with no electricity or air con, made us feel like we were truly in the Amazon rainforest. 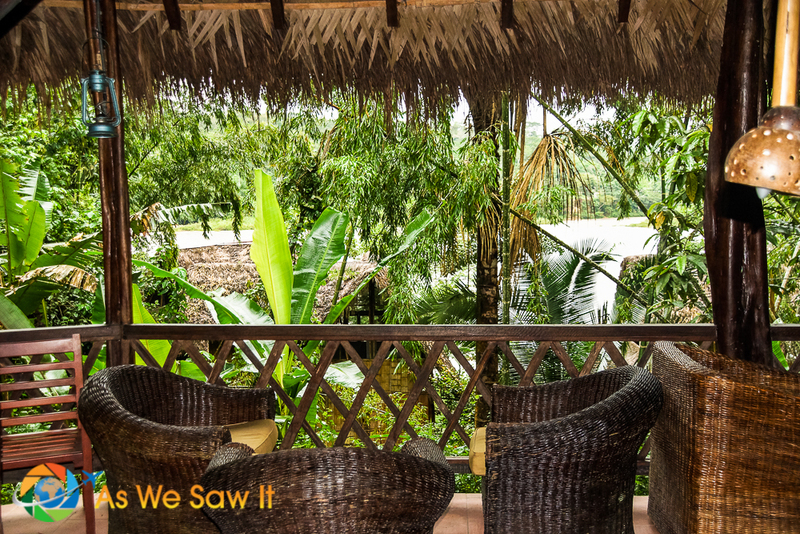 Our bungalow was on stilts – standard insurance against flooding – and its cathedral ceiling was thatched with local palms.The front and back walls were almost entirely screened for a cross-breeze, with curtains for privacy. The screening meant that the sound of the rushing Napo River would lull us to sleep and the raucous calls of Amazonian birds in the treetops would be our morning alarm. 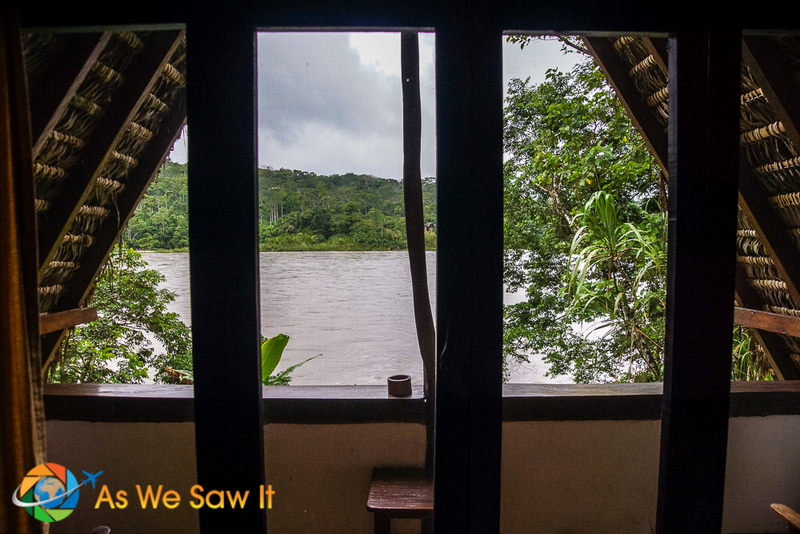 We loved our bungalow, with its comfy bed, large private bath with hot shower, and our own balcony or veranda, complete with reclining chairs to relax in and watch the river pass by. It was clean, too; I walked across the room in my bare feet a few times and didn't pick up a speck of dirt from the wood floor. It was chilly and rainy when we arrived. Who knew it could be cold in the Amazon? Apparently, when it's winter down south the cold winds blow all the way up to the equator from way down south in Patagonia. Good thing their fireplace was going strong! Once we settled in, we sat in the bar and enjoyed a drink while we chatted with some of our fellow tour members. Drinks were served with an apology the first night; they didn’t have any ice. Electricity is limited, I guess. Each evening at sunset, the staff lit torches along the walkways. The glow from the flames were yet another reminder that we were in another world. Thoughtfully, every evening they brought a lantern and battery-powered light to our bungalow; they provided all the light we needed for reading and getting ready for bed. 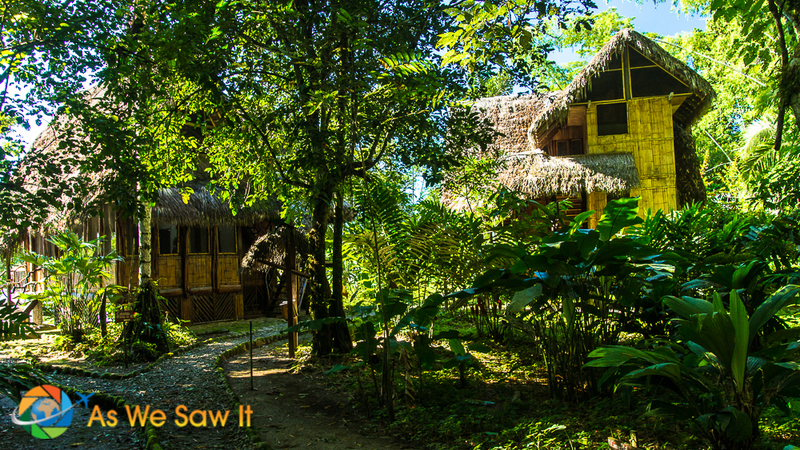 We have a few more photos of Cotococha Amazon Lodge our Cotococha photo gallery, if you're interested, and you can learn more about staying there here. But we didn't just lounge around in Ecuador's Amazon basin. 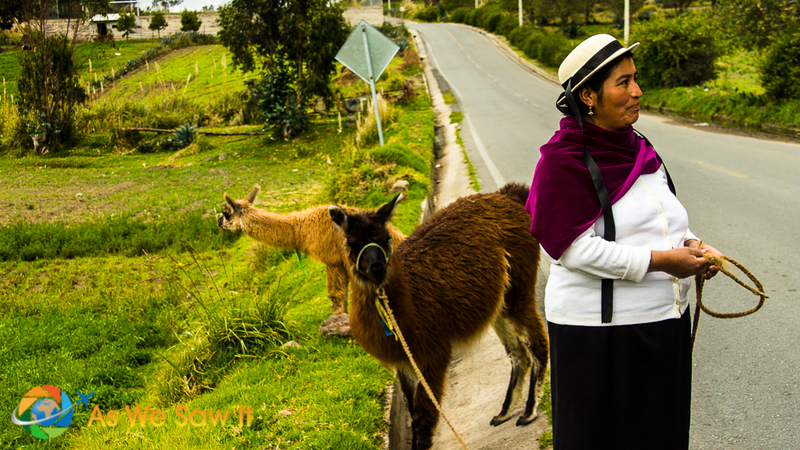 Cotococha offers a lot of different activities, including an interesting visit to an Amazon animal rescue center. I like the idea to be so close to nature but still experience a comfortable bed and a hot shower. It must have been a one-of-a-kind experience to sleep in the jungle, Linda. The only think that would scare me would be snakes and mice sneaking in. Did you have any encounter with such kind? Anda, Dan has yet to see a snake in the wild anywhere – it’s an ongoing joke between us. No one on our tour had any pest problems except for a couple of mosquitoes that might have sneaked into the cabins with us. Our cabins were elevated, built on stilts next to a big river, and the only snakes we did see were in cages at the animal rescue station. Thanks, Lesley. I hope my posts are inspiring. Where do you dream of traveling, and when do you think you might go? I want to go everywhere, eventually! We are on a 4 yr ish countdown. This is mainly to get our kids through school and put enough money away to go. We are at an age when, once we go, I don’t want to have to return to work, ever. I want to slowly travel the world, able to experience it all and maybe settle in the places we love for a bit longer. This could take years 🙂 so we’re also having to finish “retirement planning”, it’s going to be a tough few years but anything worth having requires a bit of sacrifice. The problem with living overseas is that, if you can live anywhere, you want to. Once we realized that we had no restrictions it was like being a kid in a candy store. “We could live here, we could live there …” There are places in South America, Africa and Asia that are incredibly affordable! Some people think you have to be rich to travel; I say, you have to be rich to stay home. How fun to have the little critters there to welcome you! How long do you think you’ll spend in Ecuador? We haven’t decided how long we’ll be here, but at least until late September, when we leave for TBEX in Dublin. Will you be there, or perhaps at TBU in Jerusalem? We’d love to meet you, if so. I’ve just started following your Facebook page and am now checking out your site, which looks great. How exciting to have just moved to Ecuador. Am curious to know how you are able to live for extended periods abroad – it’s something I’d love to do but it seems so difficult – I don’t mean financially but rather in terms of being able to legally reside in other countries. Any advice would be welcome! Thanks for the compliment! We love Ecuador – especially the food prices! We’ve been traveling on tourist visas, mainly visas on arrival. It fits well with our travel style. I’ve written a couple of posts about how we do it: How to Live Overseas: Visa Run and 5 Ways to Extend a Tourist Visa. Please let me know if they answer your questions or if I’ve missed something. Happy to help! Thanks, Freya, it was fun. We haven’t been to Quito or Galapagos yet, hope to get there this summer. That looks incredible! I would get eaten alive by mosquitos, but probably not care. Congrats on the big move! The funny thing is, we didn’t get a lot of bug bites. Perhaps it’s because the weather was cool, who knows? Thanks for the good wishes. We like it here. Looks like a really cool place to stay! Can’t wait to hear and see more about the Amazon.And congratulations on your new move! It’s a great place, but not for people who want to lounge by the pool … there’s too much to do, and besides, there is no pool! Thanks for the contratulations; we’re looking forward to sharing more about our trip and our new home.